Product prices and availability are accurate as of 2019-04-16 09:20:30 UTC and are subject to change. Any price and availability information displayed on http://www.amazon.com/ at the time of purchase will apply to the purchase of this product. Measure Insulation Resistance to 60G? with test voltages of 500V, 1000V, 2500V, and 5000V. Comes with test leads, eight C batteries, 120V AC adaptor, heavy duty carrying case, and user manual. Polarization Index measurement (PI), Dielectric Absorption Ratio measurement (DAR), AC/DC Voltage measurement to 600V with Min/Max, Peak and Relative functions, and 1 to 15 minute timer function for IR measurements. 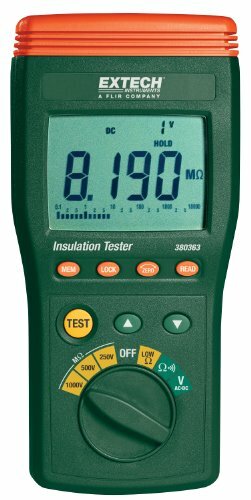 Insulation testers can be used to test motor, transformer windings, instruments, and appliances, check for moisture in wire and cable assemblies, safely evaluate a new wiring installation, and check for carbon tracking in breakers, relays, and switches. 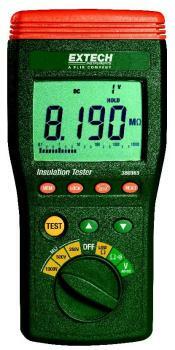 Extech Insulation Testers offer high sensitivity to assure reliable monitoring of low resistance motor windings. The autoranging Extech 380260 digital insulation tester has a large, easily readable backlit LCD with dual display of insulation resistance and test voltage. It measures insulation resistance in three selectable voltages of 250, 500 and 1000V and Insulation Resistance to 2000M?. A Lock Power On function allows for hands-free operation. Data Hold capability freezes the displayed reading. Additional features include: Lo ohms for testing connections and Auto Power Off for conserving battery life. Complete with heavy-duty test leads, alligator clip, hanging strap, protective carrying case, six AA batteries, and user manual. Optional NIST Certificate of Calibration with data available (Model 380260-NIST). Safely tests wiring insulation of motor, transformers, instruments and appliances with three test ranges to choose from: 2000M/1000V, 200M/500V, and 200M/250V. Also measures continuity to 200 ohms and AC voltage to 600V. Additional features include: data hold, auto power off and overload protection to 2200V (up to 1 min.). Press To Test button automatically discharges circuit capacitance and can be locked down to enable hands-free operation for 3-minute test. Comes complete with six AA batteries, heavy-duty test leads, alligator clip, large probe, case with neckstrap, and user manual. Optional NIST Certificate of Calibration with data available (Model 380360-NIST). 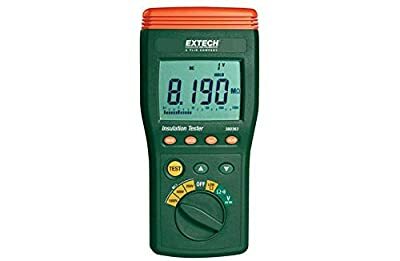 Measure Insulation Resistance to 60G? with test voltages of 500V, 1000V, 2500V, and 5000V. Additional features include: Polarization Index measurement (PI), Dielectric Absorption Ratio measurement (DAR), AC/DC Voltage measurement to 600V with Min/Max, Peak and Relative functions, and 1 to 15 minute timer function for IR measurements. Complete with test leads, eight C batteries, 120V AC adaptor, heavy duty carrying case, and user manual. Megohmmeter with large easy-to-read analog display and live circuit warning has three test voltages (250V, 500V, 1000V) and an insulation range to 400M ohms. It also measures continuity (3 ohms), resistance (500 ohms) and AC Voltage (600V). Additional features include: Lock Power On for extended test times, automatic discharge circuit, fuse protection, 1.3mA short circuit current, and CAT III-1000V safety rating. Comes with test leads, six AA batteries, hard carrying case, and user manual.